Play starts with a batter standing at home plate, holding a bat. The batter waits for the pitcher to throw a pitch (the ball) toward home plate, and attempts to hit the ball with the bat. The catcher catches pitches that the batter does not hit—as a result of either electing not to swing or failing to connect—and returns them to the pitcher. 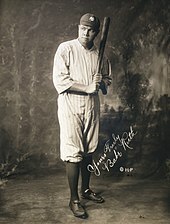 A batter who hits the ball into the field of play must drop the bat and begin running toward first base, at which point the player is referred to as a runner (or, until the play is over, a batter-runner). A batter-runner who reaches first base without being put out is said to be safe and is on base. A batter-runner may choose to remain at first base or attempt to advance to second base or even beyond—however far the player believes can be reached safely. A player who reaches base despite proper play by the fielders has recorded a hit. A player who reaches first base safely on a hit is cred with a single. If a player makes it to second base safely as a direct result of a hit, it is a double; third base, a triple. 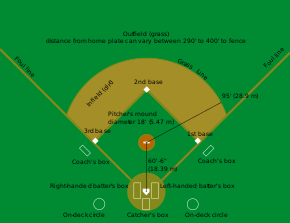 If the ball is hit in the air within the foul lines over the entire outfield (and outfield fence, if there is one), or otherwise safely circles all the bases, it is a home run: the batter and any runners on base may all freely circle the bases, each scoring a run. This is the most desirable result for the batter. A player who reaches base due to a fielding mistake is not cred with a hit—instead, the responsible fielder is charged with an error. 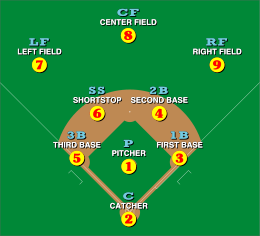 Several basic offensive tactics come into play with a runner on first base, including the fundamental choice of whether to attempt a steal of second base. The hit and run is sometimes employed with a skillful contact hitter: the runner takes off with the pitch drawing the shortstop or second baseman over to second base, creating a gap in the infield for the batter to poke the ball through. The sacrifice bunt calls for the batter to focus on making contact with the ball so that it rolls a short distance into the infield, allowing the runner to advance into scoring position even at the expense of the batter being thrown out at first—a batter who succeeds is cred with a sacrifice. (A batter, particularly one who is a fast runner, may also attempt to bunt for a hit.) A sacrifice bunt employed with a runner on third base, aimed at bringing that runner home, is known as a squeeze play. With a runner on third and fewer than two outs, a batter may instead concentrate on hitting a fly ball that, even if it is caught, will be deep enough to allow the runner to tag up and score—a successful batter, in this case, gets cr for a sacrifice fly. 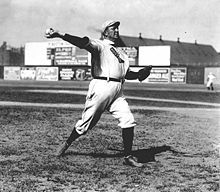 The manager will sometimes signal a batter who is ahead in the count (i.e., has more balls than strikes) to take, or not swing at, the next pitch. After being admitted to the Olympics as a medal sport beginning with the 1992 Games, baseball was dropped from the 2012 Summer Olympic Games at the 2005 International Olympic Committee meeting. It remained part of the 2008 Games. 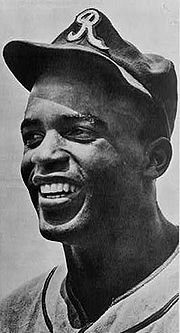 While the sport's lack of a following in much of the world was a factor, more important was MLB's reluctance to have a break during the Games to allow its players to participate. MLB initiated the World Baseball Classic, scheduled to precede the major league season, partly as a replacement, high-profile international tournament. 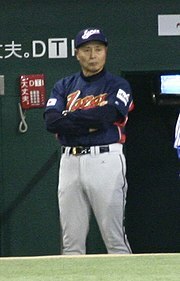 The inaugural Classic, held in March 2006, was the first tournament involving national teams to feature a significant number of MLB participants. The Baseball World Cup was discontinued after its 2011 ion in favor of an expanded World Baseball Classic. Modern fantasy sports began in 1980 with the invention of Rotisserie League Baseball by New York writer Daniel Okrent and several friends. Participants in a Rotisserie league draft notional teams from the list of active MLB players and play out an entire imaginary season with game outcomes based on the players' latest real-world statistics. Rotisserie-style play quickly became a phenomenon. Now known more generically as fantasy baseball, it has inspired similar games based on an array of different sports. The field boomed with increasing Internet access and new fantasy sports-related websites. By 2008, 29.9 million people in the United States and Canada were playing fantasy sports, spending $800 million on the hobby. The burgeoning popularity of fantasy baseball is also cred with the increasing attention paid to sabermetrics—first among fans, only later among baseball professionals. ^ Block (2005), pp. 139, 140, 151, 164, 178, 179, et seq. ; Hellier, Cathy. "Mr. Newbery's Little Pretty Pocket-Book". Colonial Williamsburg Foundation. Retrieved April 12, 2008. See Wikisource ion of A Little Pretty Pocket-Book.